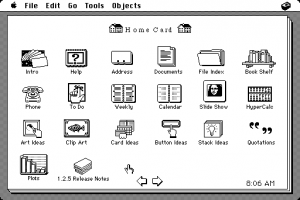 HyperCard is a slide/card based presentation suite created by Apple Computer. educators, commercial solution providers and in-house developers. double-clickable applications which can be distributed without royalty fees. International for easy creation and editing of animation. lauded as a key Apple technology by educators and business users worldwide. AppleScript, UserTalk from UserLand and CEScript from CE Software. "HyperCard 2.2 is an optimal choice for commercial solution providers. from Random House Electronic Publishing. and sound editing to help users enhance the value of new and existing stacks. compelling courseware while preserving ease-of-use for students. including French and Japanese, using AppleScript dialects extensions. contact the Apple Software Programs Customer Service at (800)-769-2775, ext. through the Apple volume licensing program. fee by calling (800) 950-2442.